Cycling through the lava flows of an active volcano is not your typical ride. It's a great credit to the fine U.S. National Park Service for allowing tourists (and cyclists) to visit the most active volcano in the world, Kilauea (pronounced kill-oo-aa-uh) where a fissure (the precursor to an eruption) can form with only three hours warning. Cyclists here not only check the weather, but the daily seismic activity as well! 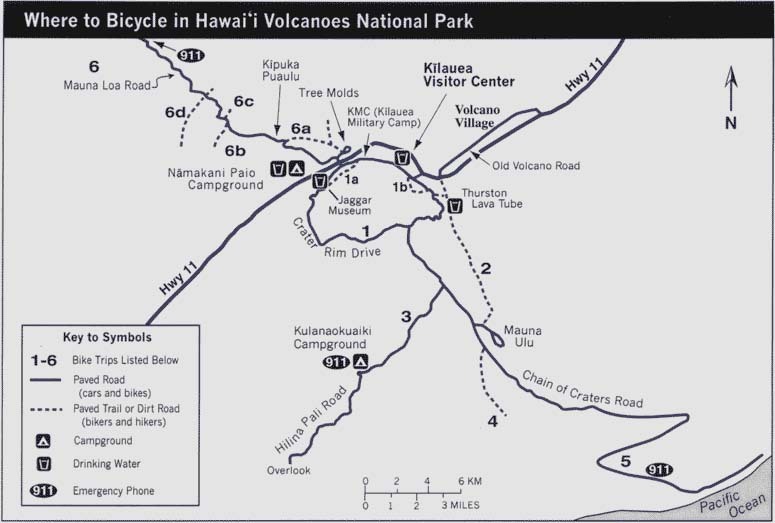 As we've encountered before, the park rangers don't necessarily encourage cycling, but cycling information is posted on the Volcanoes National Park web site. After a very early morning drive from the opposite side of the Island -- through many of the earth's climate zones including lots of rain in the rain forest -- we arrived two hours later at the Kilauea Visitor Center to perfectly sunny weather. 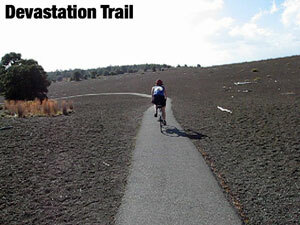 To bike and hike Volcanoes National Park one should probably allow three or four full days. But who has time to do anything properly anymore? So in the spirit of the shoddy coverage found in popular travel magazines, we describe our one day visit. From the Kilauea Visitor Center (el. 3980'), we started the long gentle descent to the Pacific Ocean by heading south on the east side of Crater Rim Drive, an 11 mile road around the Kilauea summit caldera. 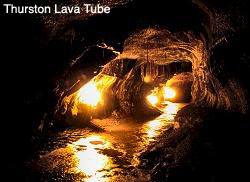 One of the more interesting stops on the east rim is the Thurston Lava Tube, located in a rain forest. Lava tubes are formed by underground lava hardening on the outside of the flow while lava continues to flow within. 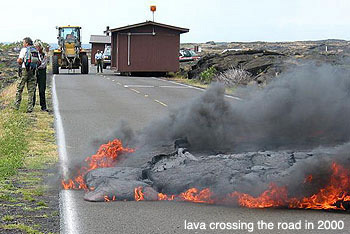 This is a very efficient way for lava to flow without cooling very fast. After the lava stops flowing, a hollow tube is left behind sometimes extending many miles, though only 200 yards of this tube is accessible to the public. It's possible to walk the short (1/4 mile) trail loop through the rain forest and tube in cycling shoes, but I recommend bringing sandals along, like we did, unless you enjoy the sensation of walking on ice. Destruction or creation? - Click the pic to watch A five minute movie featuring all the amazing attractions from our ride through the park. If you have the time then we have the bandwidth! Back on the road, we proceeded left onto Chain of Craters Road for a 38 mile out and back to the ocean. The first several miles pass by many small craters that pit the land on each side of the road like abandoned open mines. The descent gets a little steeper as you enter the vast barren landscape created (or destroyed) by the Mauna Ulu lava flows of 1969-1974. Other than a few saplings, there is not a single tree for the next 12 miles, causing the temperature to jack up 15°F to a nice round 100°F. I was hoping to catch some hot footage of molten lava chasing us down Chain of Craters Road but settled for decent 360-hand-cam action footage (see video right). 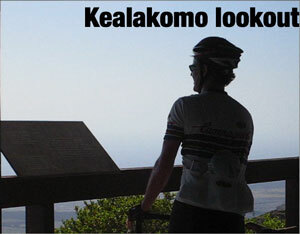 At the Kealakomo lookout stop, we discovered that we were gulping water faster than predicted and started wondering whether two bottles each was enough for this 50 mile ride. We were told by the visitor center ranger that there was no water to go along with the pot of gold (a petroglyph?) at the end of Chain of Craters Road. (I read the same in an updated parks brochure on the counter as well.) Would we die a horrible death by dehydration? Of course not, we are experienced adventure cyclists! Rebecca simply got on her cell phone and called her family who left Puako several hours after us and ordered up a couple Dasanis to go while they happened to be at a gas station. We rationed our water nonetheless in case we missed them. From Kealakomo lookout, the descent gets steeper, but nothing crazy. The view is fabulous in a vast-desolate-barren sort of way... kind of like Death Valley except there is an ocean at the end of the descent. Picture taking was very difficult at this point with the bright mid-day sun reflecting off the black glistening lava and Pacific Ocean. We cycled as far the road would take us, to where a mass of lava from a recent (2000) Pu'u 'O'o lava flow blanketed the road. Looking out across the Pacific Ocean it seemed we had reached the end of the world. Hawaii is further away (2400 miles) from any mainland than any other island/archipelago on earth. Those better equipped for an lumpy hike could walk four miles further for the chance to see fresh lava flowing into the ocean. The 19 mile climb back up to Crater Rim Drive is gentle except for the 1312 foot high Holei Pali escarpment along the Hilina fault system. While climbing you'll notice several lava rivers now frozen in time. The land under our wheels is younger than us... providing a fresh prespective of the earth's more volatile past. Before reaching Crater Rim Drive we encountered Rebecca's family. We had rationed successfully, but were down a quart or so and eagerly guzzled the extra water. (Thanks again!) Turns out there was water for purchase at the end of the road by the ocean. I wonder why the rangers threw us off? Perhaps it was to discourage us from cycling all the way down there, or maybe the water supply is unreliable? Now back to Crater Rim Drive, where our next stop was Devastation Trail. We did a very cool one mile out and back along a nicely paved trail to the smoldering Kilauea Ili Crater where we shot some video while cycling through the splatter and cinder of the 1959 eruption, when fountains of lava reached 1900 feet high! The fun continued as we headed west to complete the second half of Crater Rim Drive. We stopped and hiked to the Halema'uma'u Crater outlook. It's a 3000 foot wide crater with “hazardous volcano fumes” seeping through the cracks in the land all over the place including under our feet. Were we still on earth or on some evolving planet? The Halema'uma'u Crater expels about 300 tons of sulfur dioxide daily both within the crater and along the rim. We completed Crater Rim Drive loop along the north side with a tour of the Jagger Museum overlooking the Halema'uma'u Crater, a stop at the steam vents and then a one mile detour cycling Sulphur Banks Trail where we had the opportunity to sniff more hazardous volcano fumes. Lookout... she's going to blow! 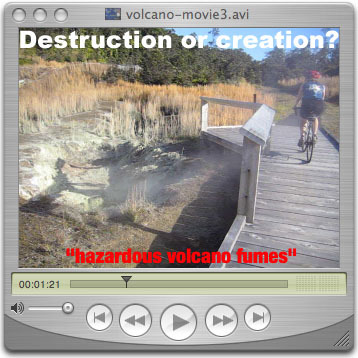 YouTube videos, from Volcanoes National Park, of fresh lava flowing into the ocean. Hawaii is the only State that literally grows.